"Us in the Mission of God"
Welcome to the World Christian Week 2015 website! This week is going to be full of exciting events and chances to learn about what God is doing all over the world. Check out the fun events that have been planned, the agencies being represented this week, things to be praying for throughout the week, and the sensational international cuisine that will be served in the cafeteria. So explore the website to discover what's in store, and join in the fun this week! 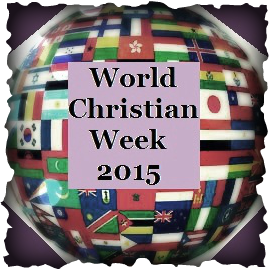 Click here for a downloadable copy of the World Christian Week brochure. Contact us! We would love to answer your questions and hear your feedback!